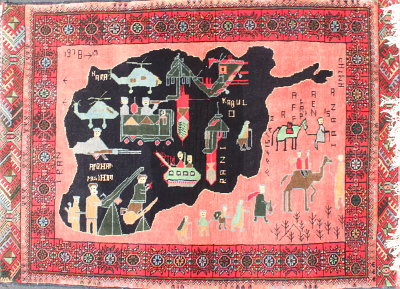 Afghanistan Map Rug with Province Names and Soviets Departing. The condition of this new Afghan rug is excellent. By all technical means, this has no commonly known ""war"" images of weapons. However, we feel they are important art forms to be included in a war rug collection. This is because these rugs are derived from war rugs, and also because many maps were first charted for reasons either for war, or as a result of war. Territories and borders are often the only, and oldest, reasons for war. This map rug showcases a compass, flag of Afghanistan, and a map with the Provinces written in Farsi. Also in Farsi are the names of the surrounding countries. In fact, the only text written in English is ""Made in Afghanistan"" and ""2002"". Please allow us to point out the flowers in the corners of the rug. Tightly woven, very soft and comfortable underfoot. A black silhouette of Afghanistan is filled with figures with guns, tanks, helicopters, and canes. Figures ride camels and lead horses away from the country with canes and walking sticks. Green, blue, yellow, and brown geometric medallions form a border around the scene and another set of thick bands of geometric shapes frames either side of the rug. The elaborate kilim adds even more intricacy to the craftsmanship.